What to look for in a Digital Picture Frame? It's best to look for a digital frame with high resolution, large memory, versatile functions and easy to use. 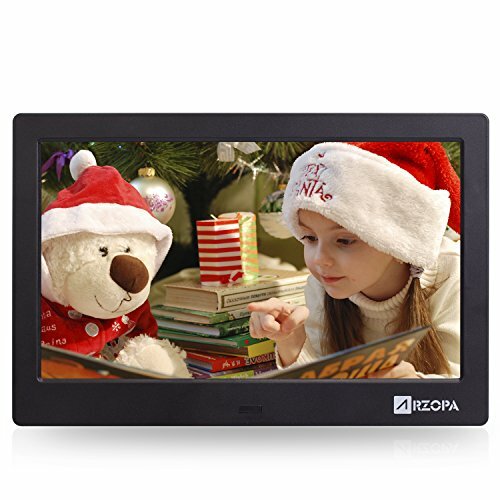 ARZOPA electronic picture frames meet all your needs. IPS widescreen high-definition screen ensures that your photos are shown with remarkable image quality, in rich and vibrant colors. Supports various picture, video and audio formats. Supports SD/SDHC/MMC/MS (up to 32 GB), you can store a greater number of images, which will add your viewing pleasure. Includes built-in clock, calendar and auto on / off timer. Perfect for use in both the home and office! Equipped with a remote control, which can be quite helpful if you want to hang the frame on a wall where it's awkward to reach. 【IPS HI-RES DISPLAY】 10-inch IPS Widescreen High-definition Screen, 1024x600 high-resolution, 16:9 Golden Aspect Ratio display pictures, different perspectives always showing high-definition real picture effects. This digital picture frame is an indispensable decoration for homes, offices and companies. 【PHOTO & VIDEO PLAYBACK】 Support HD 720p and partial 1080p video in different formats. Support random playback of pictures and playing of background music. 【EASY TO USE】 Support USB 2.0 interface; U disk; SD/SDHC/MMC/MS (Max 32G). One digital frame can store hundreds of pictures. To guarantee smooth playback, we recommend storage within 300 pictures. No need to install, plug and play, instant display of all digital photos and videos. 【SMART FEATURES】 Equipped with smart wireless remote control with remote control distance of 4m. Upgrade extended charging cable for easier use (from 120cm to 150cm). With Clock/Calendar/Alarm Clock, Automatic Timer Switch function. 【IDEAL GIFT & WARRANTY】 With elegant and stylish appearance and an inch of ultra-thin narrow edge design. This digital photo frame is absolutely the perfect Christmas and New Year gift for your loved one. ARZOPA offers a 24-hour professional service center with a 30-day full refund, 12-month quality warranty and 365-day technical support. If you have any questions about this product by Arzopa, contact us by completing and submitting the form below. If you are looking for a specif part number, please include it with your message.